While I do not make New Year's resolutions, I do think it's important to set goals for myself. So I decided to buy a cookbook and make everything in it. It doesn't matter if its something I normally wouldn't make or an ingredient that I may not like or haven't tried. I'm determined to get through the whole book. I hope to learn some new techniques, try different ingredients, and explore various cuisines. I went to Barnes and Noble and browsed the cookbook section. 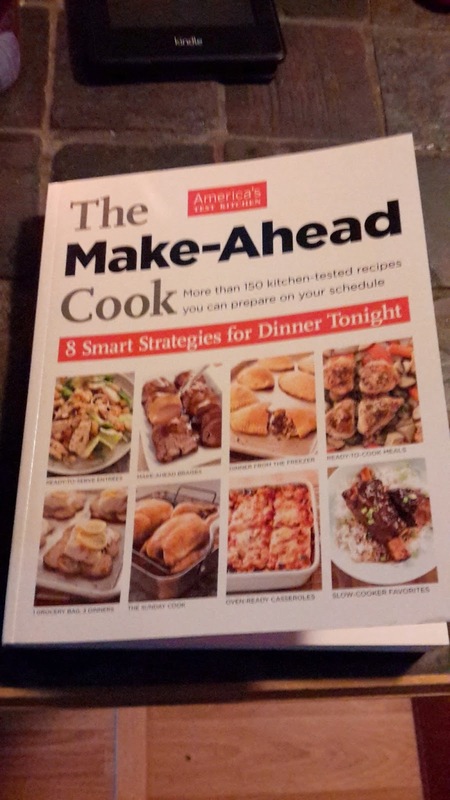 I decided on the Make Ahead Cook by America's Test Kitchen. It has over 150 recipes and various types of cuisine. The book is broken up into different sections such as meals that you can prepare and then finish cooking the next day, slow cooker recipes, meals that you can freeze, and meals that you can, prepare, put in the refrigerator and finish later. I decided to start off with Roasted Chicken and Root Vegetables. 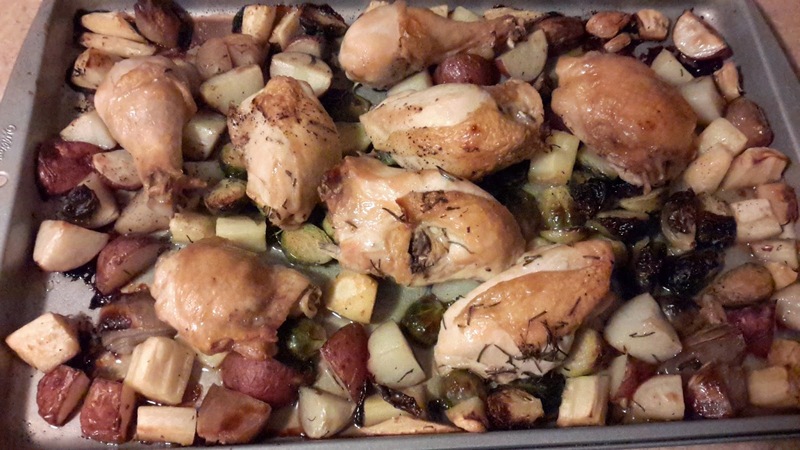 I've made one-pan chicken and vegetables before. It's good, but the vegetables really don't get crisp. They sit in the chicken juices, get steamed, and taste greasy. This recipe resolves that issue. Instead of using a whole chicken, a cut-up chicken is used. The individual chicken pieces give off less moisture. After the chicken is done, the vegetables go back in the oven for one last blast at high heat, which gives them great color and flavor. 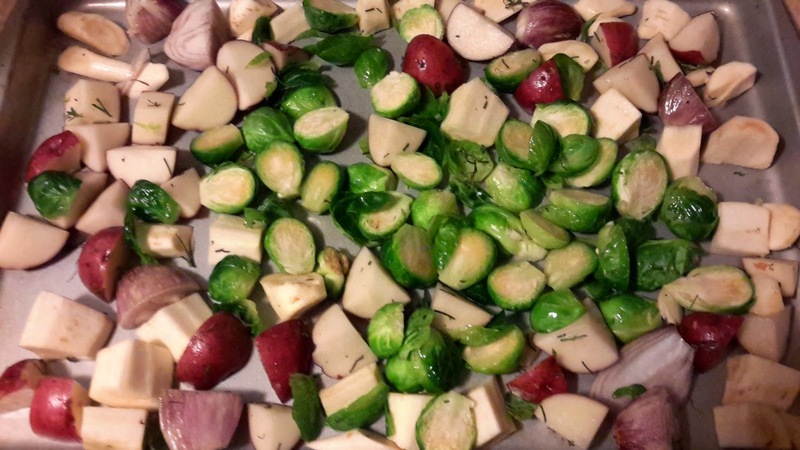 I used parsnips, potatoes, shallots, and Brussels sprouts. 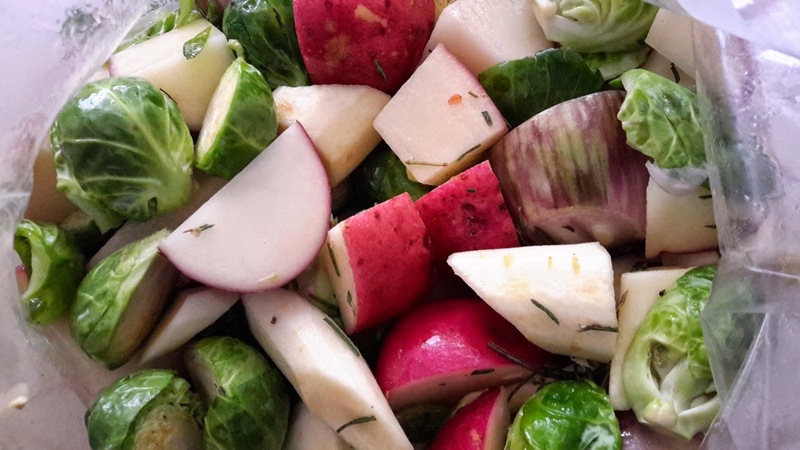 The vegetables and chicken marinate in herbs and olive oil for a few hours, then are roasted in the oven. You can view the complete recipe here. 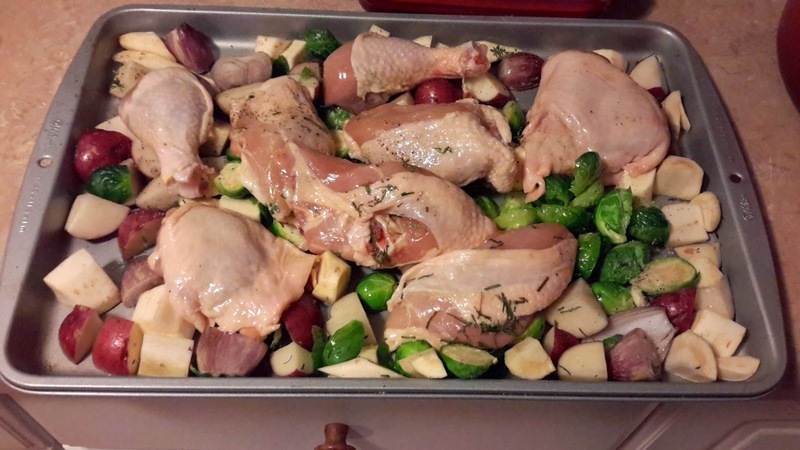 White meat in the middle of the pan ensures it stays moist.